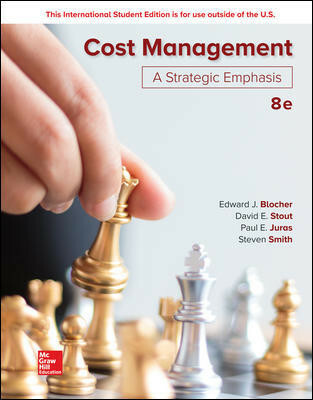 Cost Management: A Strategic Emphasis, by Blocher/Stout/Juras/Smith is dedicated to answering the question: Why Cost Management? It answers this question by providing cost-management tools and techniques needed to support an organization's competitiveness, improve its performance, and help the organization accomplish its strategy. The text is written to help students understand the broader role of cost accounting in helping an organization succeed - and not just the measurement of costs. While the text does include coverage of traditional costing topics (e.g., job-order costing, process costing, service-department cost allocations, and accounting for joint and by-products), its primary strength is the linkage of these topics, as well as more contemporary topics, to an organization's strategy. And with Connect, an easy-to-use homework and learning management solution that embeds learning science and award-winning adaptive tools to improve student outcomes, instructors receive a course solution that includes high quality content and assessment paired with assignments that help students build the skills they need to succeed. New Co-author: Steven D. Smith is an associate professor of accountancy and the Kristine V. and Randy J. Vest Fellow in the Marriott School of Business at Brigham Young University (BYU). Professor Smith's expertise is in the areas of management control systems, focusing on the provision of incentives and performance measurement.